The American craft beer landscape is an ever-expanding picture, but if you want to call yourself a seasoned beerhunter, you need to wander off the map from time to time. So in late May I set off on vacation to Peru, primed to enjoy a break from routine — and to put those precious vacation days toward some research of my own. My main point of curiosity is the interplay between culture and beer. When sitting down in a faraway place, does a foreign bottle in your hand make you feel more at home, or less? For this trip, I settled down for a week in Cusco, Peru, a beautiful city nestled high up in the Andes mountains. From the 13th to 16th centuries this was the capital of the Inca empire, and many large stone ruins still stand. When the Spanish conquistadors invaded in the 16th century, they did pretty much what you would expect: they tore down temples and palaces, built new plazas and Christian churches, and plunked down European architecture everywhere — including a pretty incredible cathedral. Sometimes it rains. Every now and then there’s a huge earthquake. But from day to day, Cusco is gorgeous, filled with strange juxtapositions of Spanish and Inca indigenous architecture. Walk the cobblestone streets up and down these steep residential hills, and you can see why it’s a UNESCO World Heritage site. Okay, but what about the beer? I was in the mood for a nice cold one when I stepped off the plane. Then I thought better of it. At an elevation of 11,000 feet, Cusco is higher than any city in America, and visitors often get some minor altitude sickness. But after a day of fatigue and some dizziness, I decided it was time to start my research in earnest. To try my first Peruvian beer, I needed to wander no further than the tiny family-run corner store at the end of my street. To my eye, the dimly lit and jam-packed space looked more like a back stockroom than a store, but it was certainly convenient. Here, in a cooler, I found cold bottles of Cusqueña. This is no artisanal beverage. 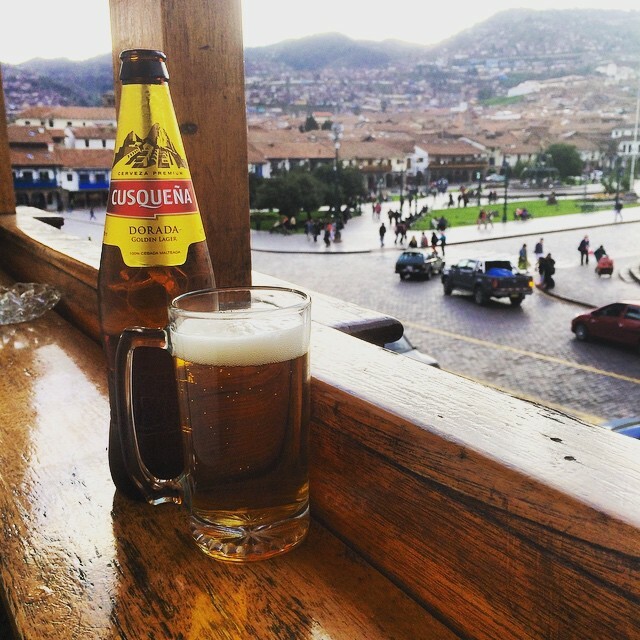 Cusqueña is brewed here in Cusco, as its name implies, but it is made by the London-based SABMiller, which is the second-largest brewer in the world after Anheuser-Busch. Still, plenty of locals drink Cusqueña, and I wanted to find out whether it was as thin and unenjoyable as most of the world’s mass-produced lagers — in other words, as bad as a Bud. Surprise, surprise: Cusqueña is actually pretty great. Their golden lager, called Dorada, is simple and straight-forward, but not watery. It’s not overly carbonated, and it has a thick, malty smoothness that I would enjoy drinking even if it were served a few degrees short of ice-cold. Cusqueña also makes a red and a white lager, both of which are a bit more sugary, but still good. The only misfire is their Negra, a syrupy dark lager that is almost undrinkably sweet. Cusqueña is everywhere (you can even order it online, if you’re so inclined), so there was no avoiding it. But I had to search harder for my next prize: a glass of beer made by Sacred Valley Brewing Company. This company is run by master brewer Joseph Giammatteo, who used to work for Oakshire Brewing in Oregon, and I was curious to see whether the American craft beer ethos could thrive in such a distant setting. They don’t distribute outside of Peru, so I’m glad I grabbed the chance. Their beer is delicious. I didn’t get to sample every ale they make — which included IPA, Belgian, and sour varieties — but I did get to try their Roja red ale and their coffee stout. To do so, I had to track down one of the three bars in Cusco that sell Sacred Valley on draft. This led me to Paddy’s Pub, which claims to be the highest altitude Irish pub in the world. Stepping from a Spanish-speaking plaza into this dark wood-panelled refuge for ex-pats was a bit surreal, but after a few minutes I settled in and enjoyed my pint of red ale poured from the tap. Sacred Valley uses glacial spring water and good ingredients you can taste. The ale smelled great, had a nice malty bite, and went down smooth. As for the coffee stout, the cool silky texture and not-too-powerful roasted flavor held up well against its many North American counterparts. Still, I felt restless. Sampling a Cusqueña in Cusco is all too typical. And sipping craft beer here is something of an oddity. This Peruvian beer story was missing a chapter. A few days later, I figured it out. On a narrow side street, I found what I had been missing: a chance to try chicha de jora. This is beer made from fermented corn, a traditional Andean refreshment. Germinate some maize, boil it, and let the sugars ferment in an earthenware vat for a few days, and you’ve got yourself a low-alcohol folk drink. You don’t see chicha produced in mass quantities, and there’s a good reason for that. The easiest way for a chicha maker to prime the corn sugars for malting is to gently chew the corn before boiling it. It may seem odd, but the enzymes in saliva turn corn starch into maltose, which greatly expedites the process (in pre-modern Japan, sake used to be made this way, too). Chica tastes thin, and a bit sour, like weak hard apple cider. Who do you drink it with? It depends on whether anyone discovers your particular tucked-away chichería. When I stopped in, I sat with three quiet, smiling Peruvians and one or two curious backpackers. Do I miss chicha? Not at all. But am I glad I tried it? You bet. For the first time on that trip, sitting for a few minutes on the back patio of a nondescript Cusco residence, I felt strangely at home. ∎ On Thursday, June 11, 5-7 p.m., the Colrain beer CSA Stoneman Brewery hosts a tasting of their newest beer share. This batch was developed in collaboration with Berkshire Brewing Company and Amherst Brewing Company. The tasting will be held at ABC on University Drive in Amherst and will be followed, beginning at 7, by a live set from the band Colrain Living. ∎ On Saturday, June 20, Springfield hosts the annual Worthy Craft Beer Showcase. The party is held at Smith’s Billiards and Theodores BBQ on Worthington Street and will feature brews from national companies (including Stone, Sixpoint, and Sierra Nevada) as well as an impressive lineup of local offerings from Abandoned Building, Brewmaster Jack, Iron Duke, High Horse, Tree House, Wormtown, and more. Tickets at theworthybrewfest.com. Contact Hunter Styles at hstyles@valleyadvocate.com.